Fought ferociously by Greek unions, the Chinese company Cosco in the decade since it took over the port of Piraeus has remade it into the second-largest in the Mediterranean with ambitious plans to do more, as China seeks to increase investments in the country. Company officials told the Chinese news agency Xinhua their aim is to make it the biggest, using its expertise and the key geographical position on the European Union’s southern flank, and tie transport of goods delivered via ship to plans to improve railway links. China Ocean Shipping Company (COSCO Group) is a Chinese state-owned shipping and logistics services supplier company that ranks third both in the number of container ships and in aggregate container volume in the world. In 2016, the COSCO Group merged with China Shipping Group to form China COSCO Shipping. The COSCO group in 2008 got a 35-year franchise right to two of Piraeus’ container terminals and in 2016 bought a 67 percent stake in the port authority for 368.5 million euros ($420.2 million) to become the primary operator. That came when Prime Minister and Radical Left SYRIZA leader Alexis Tsipras reneged on a pledge to halt the sale of state assets despite hard-core elements in the party who don’t want any foreign companies running Greek enterprises, or investors. Piraeus is the key link in what China calls its Belt and Road Initiative, a kind of modern Silk Road to increase trade within the European Union and local officials said the company’s presence is improving the economy and sprucing up the grimy grittiness of the port area. 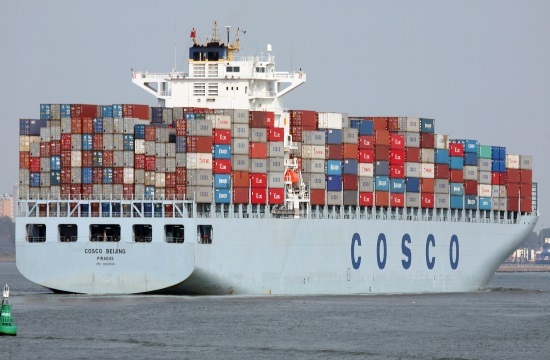 Vassilis Korkidis, President of Piraeus Chamber of Commerce and Industry, told Xinhua that COSCO’s investment is a “flagship project” for Greece that will help the onset of a rebound from an economic crisis of more than 8 ½-year economic crisis and relentless austerity. “It was an investment of more than 3.5 billion euros. A lot of activities were motivated with the development of the port, which means new jobs — much better paid jobs than other workers’ in Greece,” he said. It’s more than just money. There’s planning for future expansion. In the last 10 years, the port’s annual throughput capacity has been raised from the initial 0.68 million TEUs (Twenty-foot Equivalent Unit) to 4.15 million TEUs in 2017. The port is now ranked 36th among the 100 biggest ports of the world (Lloyd’s List), up from 93rd when the COSCO took over. “The COSCO’s investment, in my view, is the only real investment in Greece, because they brought the money and put it into infrastructure,” Korkidis said of a port that had been neglected and run down for years. Tassos Vamvakidis, PCT Commercial Manager, who who started working at the port 40 years ago when he was 16, told the news agency his decision to work with COSCO came when he saw the company’s transformation of the port, especially the container terminal. “The port’s situation had been very bad before the COSCO took it over. The customer service at the port was very poor. When I saw the great change later, I happily decided to join in,” Vamvakidis said. Not everyone thought so when COSCO first came to Greece just ahead of the crisis, seeing the opportunity in the port but where it faced resistance from workers and unions and then from SYRIZA and Tsipras. “It was one of the very first private investments in Greece ever, so the general reaction of the unions was not very good. And it took us so much time to clarify that COSCO Shipping is an investor, not an invader,” Vamvakidis said. “Very hard work was done, and day by day, we gained the respect and understanding of the market and the public. I am very happy and honored as a member of this team who convinced the market that they made a very good decision,” he said. Vamvakidis represented the COSCO Shipping to attend the first Belt and Road Forum in Beijing, China. “The Belt and Road Initiative is not just about business investment, it is about people-to-people exchanges,” he said. “I was at the people-to-people session of the Forum, and I explained how Greeks behave and their love for the sea, the world, and the time-honored civilization,” he told Xinhua. “I agree with this initiative, which is highly beneficial for Greece. We should spare no efforts joining and supporting the Belt and Road Initiative,” he added. COSCO also said it plans to turn the dingy surroundings into a center for yachts, cruise ships and other services in a 500-million euro ($612.49 million) master plan renovation. That has been submitted to local organizations and governments around Greece’s largest port after Cosco has for several years been upgrading the infrastructure and trying to bring in bigger ships to help boost the area and tourism. One of the highlights it to create the biggest shipping and repairs yard in the eastern Mediterranean, with the capacity of servicing up to 450 vessels on an annual basis, including so-called “mega yachts” as Greece is continuing to draw big numbers of foreign visitors, helping bring in critical revenues during a nearly 8-year-long economic crisis. The port management also wants to build four new hotels along with a new facility able to handle another six cruise ships and an adjacent mall, the business newspaper Naftemporiki said. Cosco has said it wants to use Piraeus as a home port for cruises catering to Chinese tourists, among others. The plan also refers to a continued increase in container traffic, the off-loading of new vehicles and the port’s connection with regional logistics hubs via a freight rail line as Cosco wants to use the port as a gateway to the rest of the European Union. Piraeus will become a terminus for the Proastiakos suburban railway, connecting the port to the international airport at Spata, northeast of the capital, said Kathimerini, which will take about an hour, far less than using a bus or a combination that includes the Metro. The new line will further connect Piraeus to Kiato in northern Corinthia and Halkida in Evia. Service on the Proastiakos will be much more frequent between Piraeus and central Athens, running every 15-20 minutes during rush hour instead of once an hour.